Microsoft has revealed the tech specs for Project Scorpio. Just how powerful is it? Scorpio employs a tuned up version of the Xbox One's AMD Jaguar CPU, with the clocks on the eight cores spun up to 2.3 GHz. That's just a bit faster than PS4's eight cores at 2.1 GHz. This is basically the same CPU as Xbox One, just clocked faster. The bigger changes were made to the GPU and memory of the unit. 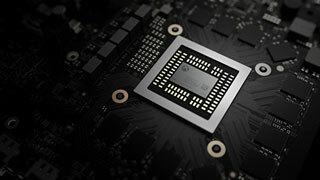 The Scorpio's GPU features 40 compute units and 2,560 shader cores, representing more than triple the graphical power of the Xbox One. For comparison's sake, it's just a little bigger than AMD's RX480 video cards. 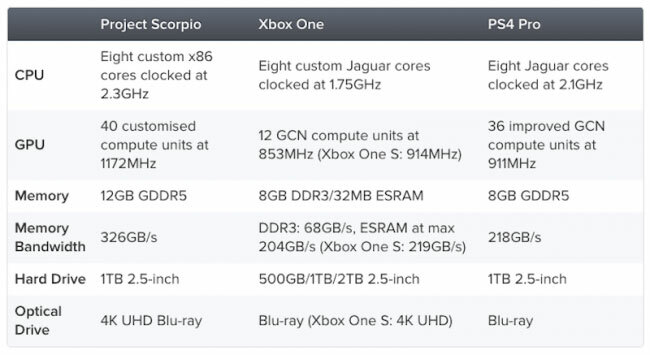 On the memory side, Scorpio eschews the 8GB DDR3 and 32 MB ESRAM configuration of the Xbox One. Instead, it's packing 12GB of GDDR5 on a 384-bit bus, clocked at 6.8 Gbps. The ESRAM wasn't needed in the new design, thanks to the Scorpio offering five times the memory bandwidth. That graphical and memory power will allow Scorpio to push games to 4K and maintain good frame rates. Scorpio will also support downscaling from 4K to 1080p, so it will be a boon even for those who don't own a 4K display. There are still some unknowns about the new console. What will it be called? When will it release? Most importantly, how much will it cost? Those questions will likely be answered at E3 this year. The bigger question that we should be asking is this: will the additional hardware power be enough to close the sales gap with PS4? Raw power is nice, but Microsoft is going to need to crank up the game offerings to make the additional horsepower worth owning.